Immortal Seats was formed by Mike and Dave (pictured below) in September of 2014. The company operates from offices in both Ocean Grove, NJ and North Providence, RI. Thousands of tickets are available daily through their web site: www.immortalseats.com, through their free “Immortal Seats” mobile app (available through the Apple App Store or Google Play Store) or by calling 1-888-933-SEAT. 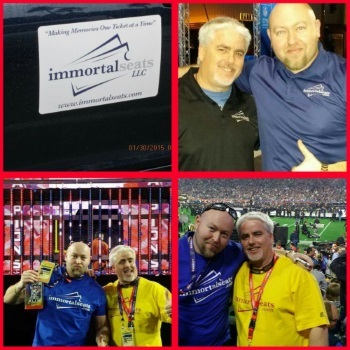 Immortal Seats also specializes in group ticket sales, Fan Van Party Bus tailgating services and other local, live events. Immortal Seats is not affiliated with any particular venue or venue box office – they offer tickets to any & all events in USA, Canada and other selected countries. All sales at Immortal Seats are final. If an event is canceled or not rescheduled, the customer will be refunded for the entire purchase price paid. For additional information on our tickets & policies, please refer to our policies page: http://www.immortalseats.com/policies. To become one of our sponsors or to advertise with us, please email tickets@immortalseats.com or call 1-888-933-SEAT for availability.